Have you seen the Childrenswear in Next lately? 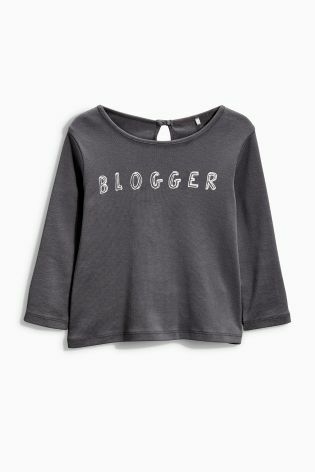 There is a grey "Blogger" t-shirt for young girls between 3 months and 6 years. Quite frankly, whilst this would suit Lily who does feature in some of my content, I am the actual blogger, so Next - is there an adult version?! This 100% cotton Blogger t-shirt by Next has a teardrop cut out at the back complete with a single white button and depending on the size, is available to buy priced between £4-£5. I am off to Next to browse the childrenswear to seek out this Blogger t-shirt for Miss Lily. And I will be jealous!